plus six recipes to try to eat healthy before and after yoga! Don't know what to eat before and after your yoga class? Try these tips and 6 yoga meal recipes for a more effective yoga practice. When to eat your yoga meals an easy question. Most people who have tried yoga right after a meal know when you do various postures, twists, a back pin, or a forward bend with a full belly it can be a bit uncomfortable. So, eat lightly before practice (at least 1 1/2 hour before when possible) but don’t fill yourself up. What to eat is a whole other story. The traditional yogi diet is lactovegetarian, which recommends sticking to dairy and vegetables for your yoga meals. A few things this diet recommends avoiding are spices (which are considered too stimulating), coffee, and alcohol. But even so, experiment and find out what works best for you. In yoga, there are no set-in-stone guidelines on nutrition. Yoga will bring you into a greater intimacy with your body. You will become more aware of what you eat and how it’s affecting you, and the lessons will be easy enough to learn. It’s completely up to the individual. This is a simple recipe that takes less than 3 minutes to prepare. Bananas are full of resistant starch molecules that take longer to digest, so you will be ready to go for a full class of yoga without feeling hungry. • Top with banana slices. 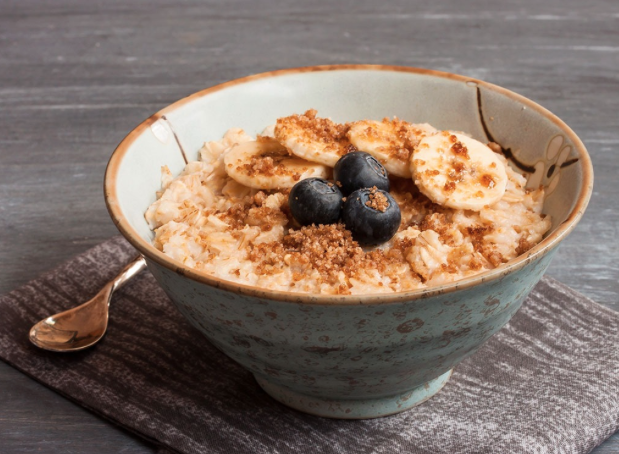 If you have more time to prepare breakfast, try this recipe. It is filled with protein and simple carbs that are quickly digested. • Fill a small pot with one cup of oats and two cups of almond milk/regular milk. Place on stovetop and cook on medium-high heat. • Stir consistently until it boils. • Add half a tablespoon of honey, half a tablespoon of vanilla extract, and one teaspoon of cinnamon. • Turn off the heat when it starts looking creamy. • Serve in a small cup, topped with walnuts, a few strawberries and/or blueberries for natural sugar, vitamins, and antioxidants. 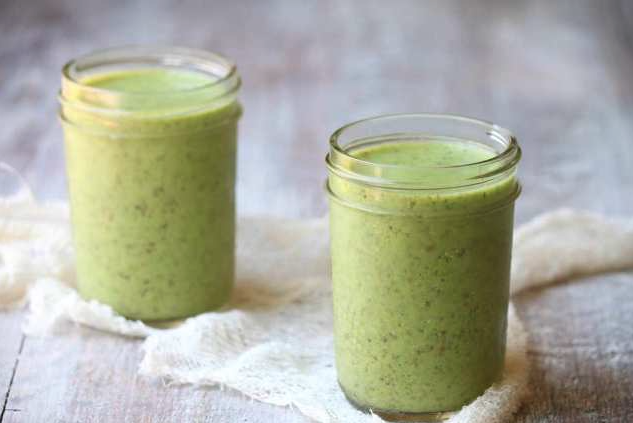 If you are in a rush, this smoothie is perfect before your yoga class, as it has a lot of nutrients in one cup. Tip: Freeze the spinach overnight so your smoothie doesn’t taste so spinach-y. Plus, it will make your smoothie nice and cold. After your practice is when you want to add more proteins in your yoga meals. 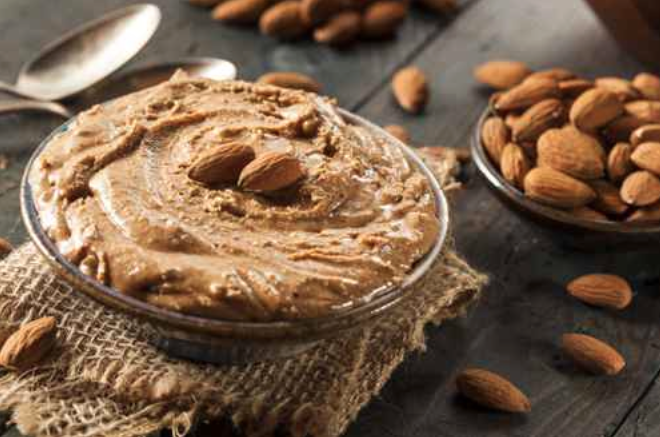 This will help your muscles recover, and carbohydrates will increase your blood sugar levels. 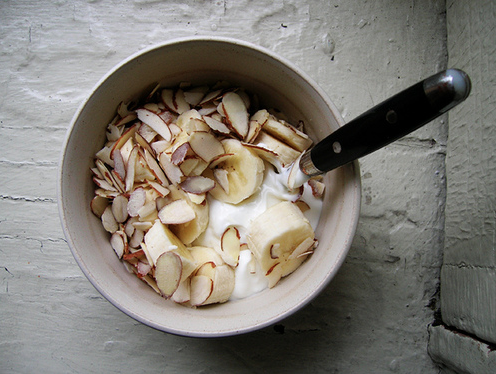 • Mix low-fat Greek yogurt and oats in a bowl. Top with almonds or cashews and one teaspoon of chia seed and flaxseed each. • If you want to increase your intake of protein, feel free to add one scoop of whey protein powder into the mixture. 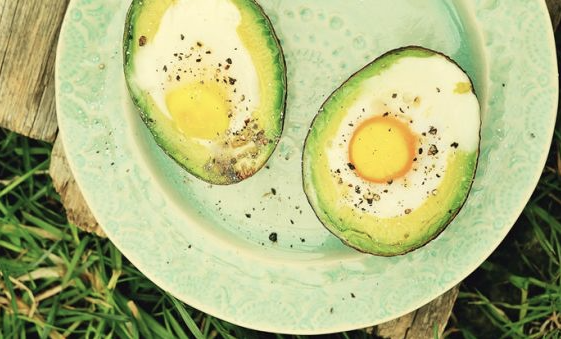 Baked avocado and eggs are a great source of healthy fat and protein. The preparation takes about 20 minutes. • Cut the avocado in half, split it open, and remove the pit. • Next, I recommend scooping some of the avocado out to make extra room for the egg. • Wrap aluminum foil around each half of avocado in the form of a basket. • Crack one egg over each half of avocado and season them up with a little bit of salt and black pepper. • Put it in the oven for 20 minutes on 350 degrees. An easy and protein-rich meal for a post-yoga class. Mix everything in one big bowl, and preheat a pan with olive oil and start cooking. 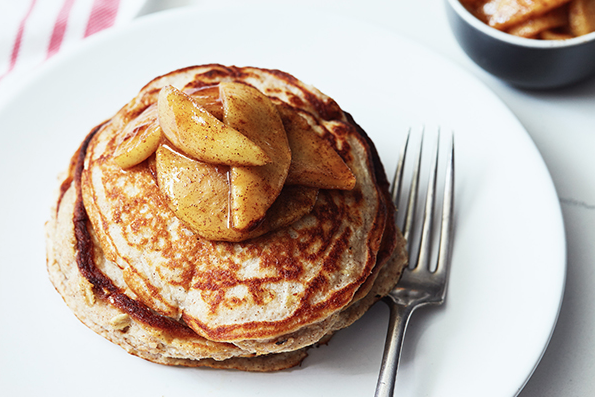 At the end, top the pancakes with a fruit of choice for the much-needed vitamins. Have anything else you like to eat before and after yoga? Comment below with your favorite pre and post yoga meals!